Given a position where a player has created a base between a high shimari and another corner stone of his opponent, the following sequence may occur. - is a common way to lean on white's base, creating influence while keeping white small. Use of this sequence in this position has been fashionable for a while among some professionals and amateurs, it was tried by Wang Lei first against Yi Chang'ho and then again 2 days later in the 2005 Nongshim Cup (if you trust an incomplete database on precedence). 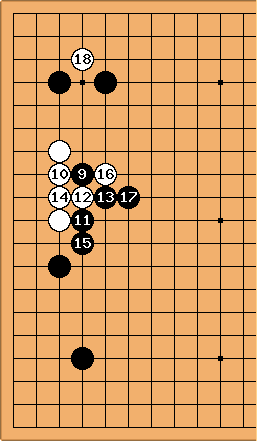 The configuration on the right side may vary, but usually consists of just two white stone, with White having played a splitting move after black created the shimari. If Black plays this way now, White can take sente to limit the Black moyo with . With a being sente against the corner White does not fear Black moving out the stone. 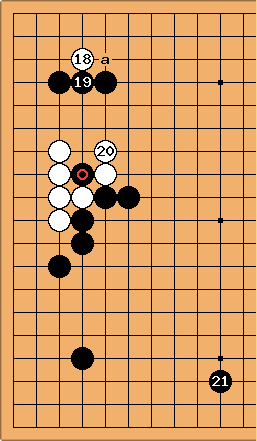 If black responds with , the stone leaves important aji in the top left corner, White can start moving anytime, leaving Black with the choice whether to concede the corner or outside influence. Bob McGuigan: This peeping move is a standard probe against the one-space enclosure. Takemiya devotes five pages and 26 diagrams to it in Enclosure Josekis. I doubt that it was invented by Yi Chang-ho. tapir: Thanks, I am admittedly not good at enclosure josekis / probes therefore the title. I looked once more in the database, in fact it occurs in the first game that features this side formation in my database, albeit played by Yi (changed accordingly). I feel bad about guessing thoughts other people might have had from statistics on a small sample, especially when they come out somewhat matter of factly. But upon looking in some game records it seems the connection is played more often than not with enemy stones in front of the shimari and here the help the weakness provides in any fighting if Black tries to make his single stone work is a strong bias towards the connection. To me this indicates that the players play the probe at this time in this context because they like the most likely answer. But they won't play it later if White already spent a move firmly capturing the marked black stone. Bob: I think you are right about the timing of the probe. Peeping from the "back" of the enclosure is also used to create aji for later use. 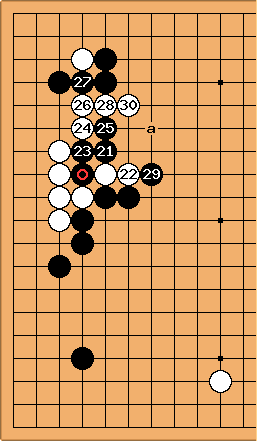 For this purpose the back side peep is also sometimes used by White in the Chinese-style opening when Black makes a one-space jump in response to White's komoku approach to the corner star point stone. I could be wrong but I think this was Kajiwara's idea. Dieter: this is a well crafted example of a probe move. Well understood, well explained. It deserves to be more than a personal subpage. tapir: I gathered some more variations on the probe under the high shimari here. tapir: My mini-chinese avoiding game setup leads me to this opening regularly. Recently I got a game review by Jiang Mingjiu of one of those... the following is a little inspired by his comment, but I don't recall it completely, maybe I should move this to BQM. The point is, that Black likely follows up with and with focus on destroying White's eyeshape in the second diagram not timidly moving out (coming back to connect with in the first diagram). Game ( ends useful) etc.